Servimac is a leader in navigation and GPS repairs in Belgium. With more than 10 years’ experience we are one of the pioneers in the field. In addition to repairs, we also sell and exchange devices meaning we can also replace irreparable or stolen devices at a reasonable price. Much has changed over our 10 years’ of experience. As you are aware, navigation and GPS devices are developing at lightning speed. This trend will continue in the years to come. It is important for us to stay up to date with the latest technical developments so we can repair the latest devices. Customer satisfaction is our top priority. As a result Servimac has earned the trust of major brands over the last 10 years. Our customers include garages (branded and non-branded), leasing companies, transport and taxi firms. Word of mouth began to spread. Our first navigation system repair did not go unnoticed. The customer let his garage know and they in turn put it on the agenda of the Mercedes-Benz dealers meeting. Servimac soon began to take shape… step by step we learned to recognise faults in Comand, APS, NGTs, etc. and sought out repair solutions. We are increasingly receiving requests to repair other brands. A new challenge. Parts, diagnoses, repairs,… but we’re equal to the test. 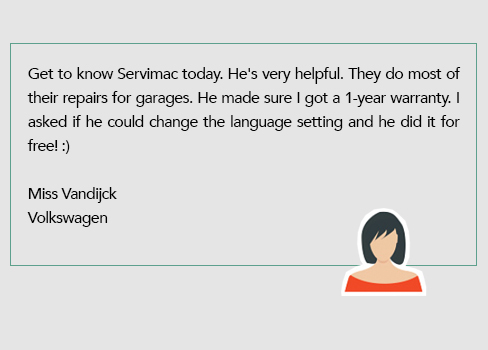 Servimac has grown to what it is today by learning something new at every turn, trying things out, failing and succeeding, tackling every challenge big or small. We would like to thank everyone for their support, patience, tips and for letting people know we’re here.